The oil-in-resin necklace from native Californian artist Michelle Stitz is a unique piece unlike anything I have come across. The pendant is in the shape of a cube measuring 1.5 by 1.5 inches. Inside the cube is an original painting made of layers of oils, paint, and resin. Mine resembles a conch shell colored with gold and a deep red, and outlined in black. The background features a shade of natural beige and has wisps of orange along the sides that almost resemble tree branches. The painting inside the pendant begs to be studied and analyzed, giving the wearer something to talk about with those who notice it. Upon my first time wearing it, I was asked numerous times where I purchased it, what it was made of and what it depicted. It’s a striking, one-of-a-kind piece and the type of necklace that makes you feel confident and independent. Quality and craftsmanship also echo from this piece—both in the smooth texture of the pendant and the two links that hold it to its chain. The chain is a thick hoop with a discreet closure, making for an elegant wear. It is a versatile piece that can be worn to work, during a night out or to a more formal event. 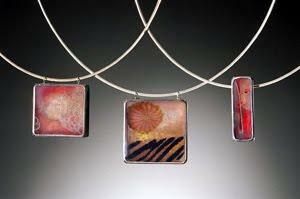 Other pendants from the series come in different shapes and feature various natural images like coral and floral designs. Colors vary from bold oranges to translucent pinks. Whichever design you choose, any of her oil-in-resin necklaces are sure to have a tranquil, inviting affect on both you and those who notice your unique jewelry.